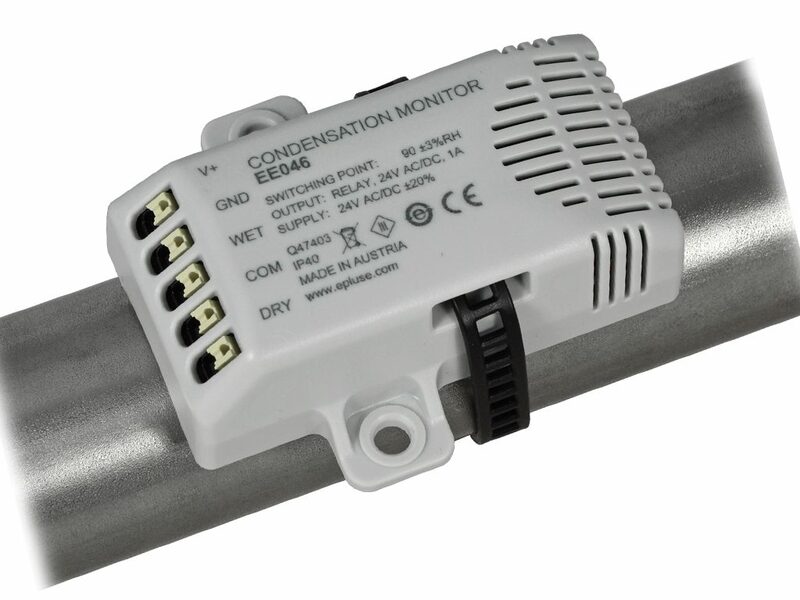 EE046 condensation monitor helps prevent condensation on chilled beams and other critical cold spots and is appropriate for mounting onto plane surfaces and on pipes with max. 50 mm (2″) diameter. Condensation on a surface occurs when the relative humidity (RH) of the air close to the surface reaches 100 % RH. Because of very good thermal coupling with the surface, EE046 measures accurately the RH of the air at surface temperature. The relay output gives an early warning when approaching condensing conditions, before condensation actually happens. It indicates also a power supply failure or a broken cable. A status LED indicates normal operation, condensation danger or power supply failure. The E+E proprietary coating protects the humidity sensor against dust and dirt.